Cozy Chicks: What Would You Do? As I’m the only one in the house who will eat egg salad, I didn’t finish all of it. I put the leftovers in a nice Tupperware-type container and stuck it in the fridge. Where it sat and sat. Weeks. Long past when I’d ever eat those leftovers. Long past when I even wanted to take the lid off to wash out the contents. Therein was the problem. I was scared to wash it out. Scared of what had grown inside the container. Scared of the smell. My goodness, the smell. Can you even imagine? I could. Which is why that container continued to sit in the fridge. Until earlier this week when I summoned all my courage, reached in the fridge and pulled it out. And threw the whole thing in the trash. PS: If Mr. W is reading this, I’m totally kidding about throwing away a perfectly good storage container. Yeah, kidding. Been there, done that. Unless it's one of my really good ones from a set, it's replaceable. But I hide them well when I do it. You are so right in throwing the whole thing away! You would never get it clean enough (in your mind) to use it again. LOL, Sharon--I didn't want to find out. Definitely, need help with the peeling eggs! The older I get, the cheaper I am (maybe it has something to do with paying a fierce college tuition). I would have asked hubby,who has an iron stomach to dispose of the contents,clean it and then put lemon juice and baking soda inside and replace the lid. But if I had to open it myself, it would have gone straight in the trash. What's frightening is how often I've done that. latest was gazpacho from pool party - still in fridge in October. Only a power failure convinced me to pitch the entire container. And now I know why you're so slim - I would have eaten the whole thing in the first place. Sadly this happens to me quite often. In fact, right now I have a container that I finally removed from the fridge, but it's been sitting on the counter. I hate wasting containers, but...you've given me the impetus to finally toss it. After all with the holidays coming I'm sure they have new containers with cute designs on-now I'll a reason to buy them! lol. Bring salted, cold water to a gentle rolling boil. Add eggs carefully using a slotted spoon. Remove pan from heat, remove eggs, and gently put them into an ice water bath for five minutes. Peel (easily!) and enjoy. Works every time. Debra, no one wanted near that container, LOL! And college tuition is painful, isn't it? Ro, I would've eaten all the gazpacho. :) I have a love/hate relationship with eggs. Katreader, new holiday containers sound like a wonderful idea! Good thinking. Yeah, I've tossed a few containers as well. I try to cowgirl up and empty them, even if there is stuff growing inside, but sometimes it's just too - icky. I tell myself I'm saving my family, that the mold and bacteria and disease is now so ingrained into the plastic, it could never be properly sterilized for another use. That's my story and I'm sticking with it. Yep, I've done the same thing. I hate to lose a container, but sometimes, it just has to be done. I would have thrown the container out along with whatever was inside. I've done this several times at work when co-workers leave stuff in the fridge for, I'm not kidding, MONTHS. Dru, I really don't know why I waited so long. Maybe I hoped the egg salad fairy would come by and take care of it. Peacecat, all bets are off when it's left for months. Crazy. Heather, if it was a glass container I think you could get it clean, but plastic, yes I have tossed them, too. 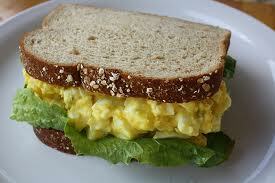 Believe it or not after reading this I want an egg salad sandwich. I'll wait until tomorrow since it is now almost midnight. Thanks for the egg tip. I will have to try it. My Mom-in-law would say that eggs that were hard to peel came from a mad hen. My aunt swears it's because the eggs are too fresh. I will try this with fresh eggs and see how it works. Love a good egg salad (minced chives!). I have thrown many a container away. As I taught in my cooking classes 'When in Doubt, Throw it Out' - goes for containers too, if you ask me! OMG, I have done the same exact thing and it was not too long ago. I did actually throw away a nice tupperware bowl because I refused to remove the lid. I can relate. I have done some serious science experiments in my refrigerator. I've also been known to keep home canned tomatoes well past what should be their expiration date if the FDA had their say. We don't eat them, but it sure is hard to throw away what would have been delicious.